Now my last foray into vibrating mascaras didn’t turn out all that well so I was a little hesitant when I first tried this product. But I had nothing to fear with this beautiful formula This mascara is fom Mirenesse's Boutique M collection which is it’s latest runway inspired range of eye and face makeup. I find the best way to use the wand is to start at the base of lashes, and then very slowly move the wand up and outwards, letting the vibrations do all the wiggling work for you to coat and define the lashes. Claims to give 24 hours lasting power and I’ll pay that because once dried, it just doesn’t budge. There is no smudging, no fall out no droopy lashes after half a day - no a single bit of change and still looks fresh 15 hours later (I didnt' test for 24 hours as I took it off before bed that night). I can’t say too many other mascara give me this results. What I love most is that for such a great formula, removal was very easy with any gentle eye makeup remover. The formula just comes off easily without having to tug and rub and with a final warm water rinse, any residues remaining were washed off easily. 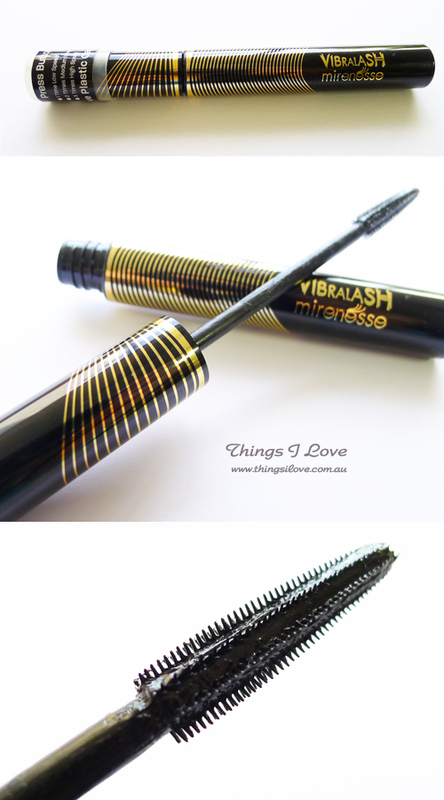 Check out the definition, lift and curl of the lashes after using Vibralash on my short sparse lashes! After 2 months of almost daily use, my tube is still going strong and it hasn’t dried up or changed consistency, which is very important as I find many mascara start off well but in a month or so time, they just dry up and become unusable. The vibralash has renewed my faith in vibration mascaras and has become one of my top rated mascaras of 2011. I'm definitely looking for refills when I’m finish with the current tube. RRP A$49.95 online at Mirenesse.com and 20% off if you are their VIP member (subscription fees applies). This product was received during last year's ABBW event. Hello my loved one! I wish to say that this post is awesome, great written and include almost all important infos. I would like to peer more posts like this .